I’m hosting an online Pampered Chef party…for only a few more days! 🙂 (through 1/27). To celebrate, I’m featuring some of my favorite Pampered Chef items here on Suzanne Shares. Missed previous posts? Read all of them including the previous 12 favorite Pampered Chef items I featured here. I bought the Pampered Chef Apple Wedger at my last Pampered Chef party. It was a last minute “throw in the shopping cart” idea. My friend, Duffy, told me, “not all apple wedgers are alike. The Pampered Chef one is worth the extra money.” So, I put faith in what she said, and I bought one. Best.decision.ever. Here’s a little history with me and apple wedgers. I bought one in college because they were the newest, greatest invention. Yes, it was a knock-off brand. I had seen the shiny Pampered Chef one, and was too cheap to buy it. So, I bought the knock-off brand. Well, “knock-off” was an appropriate term because it was a little “off”; it broke ASAP. There were very few apples wedged by that apple wedger. I was disgusted with the poor quality and punted all ideas of ever buying an apple wedger again. After all, if I had my Pampered Chef Quikcut Paring Knife, I was good to go. In a moment of weakness one year ago this month, I followed the wisdom of my friend, Duffy, and broke my vow of never buying another apple wedger. She assured me that the Pampered Chef Apple Wedger was worth it, so I took the plunge. You know, what? She was RIGHT! We’ve been using it for a year now, and it has lived up to the hype. We eat mass quantities of apples at our house (I’m currently buying them in 20 pound boxes. No lie. ), and being able to have an apple ready for my sons to devour in 30 seconds is phenomenal! My Quikcut Paring Knife does the trick, too, with my apples. However, the Apple Wedger takes the cake. It literally is so easy to prep an apple and serve it to my boys with the Pampered Chef Apple Wedger. I love that I can give them a delicious, whole food snack in turbo speed. 🙂 So, take the plunge like I did, and you’ll be glad that you did! You’ll enjoy hearing your children ask for a piece of FRUIT for a snack instead of something junk-food-esque. We also have this little beauty, “The Corer,” and we love it as well. 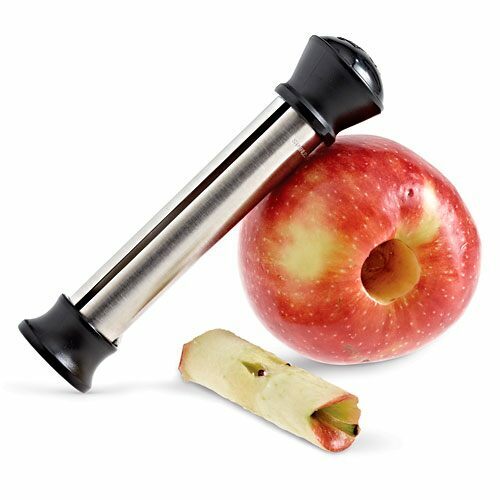 Some days my boys want their apple “not cut up, Mommy, just a hole in it.” When this request is made, I know they mean “The Corer” and not the Apple Wedger. 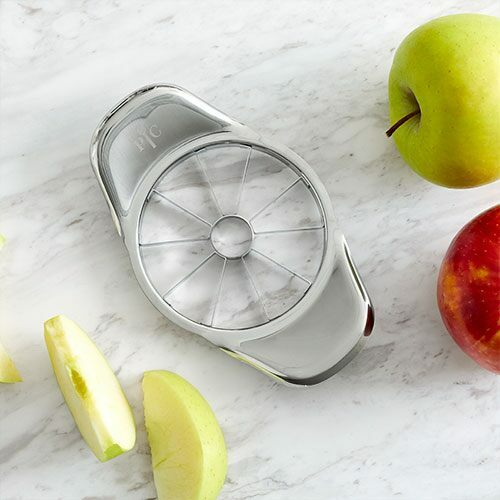 This is a fun tool that takes out–ta dah–the core of the apple! Use “The Corer” to remove the core, slice the apple horizontally, slather some peanut butter with a few mini chocolate chips in between each layer, and you have a wonderful snack or fun party appetizer! Now, you’re ready to get your Apple Wedger or “The Corer” aren’t you?!?!? You’ll be so glad you did! Click on the link below to shop online through my party. Thanks in advance! The item numbers are: Apple Wedger-#2427 or “The Corer”-#2415. To participate in my Pampered Chef online show, go here. Click on the “Shop” button on the upper left-hand corner, and shop away! Get one of these items free when you spend $60. Thanks to my fabulous neighbor, Aimee Howell, wonderful Pampered Chef consultant for allowing me to host a party! And…no worries if you don’t live anywhere near me! When you order online, you can have it shipped directly to your door! Oh, how I love shopping online.